Hhmm...where did that water come from? Normally, I start saying 'no no no no NO NO NOOO! But I didn't this time. 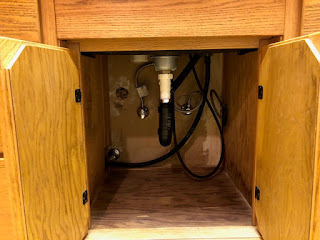 I opened the cabinets under the kitchen sink, and the water was dripping at a pretty good clip. I pulled out the cleaning stuff in the cabinet. I tried to turn it off and sure enough....I found myself holding pieces of the fixture in my hands. Bucket...no. Tupperware was closer. I put that under the steady drip. I continued to get the cleaning stuff Then I realized a pile of dish towels was within arm's length in another cabinet. I grabbed them and threw them near the sink and started mopping up the wet floors with my dish-towel lined feet.